A documentary on al-Jazeera today featured the first interview by a Western journalist with a high-ranking member of Jabhat al-Nusra, al-Qaeda’s Syrian affiliate. This was the Egyptian-Australian man Mostafa Mohamed Farag, better known as Abu Sulayman al-Muhajir. Abu Sulayman had become very quiet for the past few months, but has now broken his silence, at least in English-language outlets. For some background, in 2012 Abu Sulayman was a fringe Islamic preacher in Sydney, who often spoke at al-Risalah Islamic Bookstore and supported the Syrian uprising. By 2014, he was playing a very public and high-level role in Jabhat al-Nusra. They describe him as a member of their sharia council, and a release by Jabhat al-Nusra named his Twitter account (which had the tagline “Al-Qaeda in Al-Shaam”) as one of their three official accounts. He has appeared in several Jabhat al-Nusra videos, and became their most prominent English speaking member to address the dispute with ISIS. In one video he stated that he had been appointed to mediate between Jabhat al-Nusra and ISIS. He may have been one of several mediators appointed by al-Qaeda in 2013, when ISIS was still a part of al-Qaeda but was challenging its authority by asserting control over Jabhat al-Nusra. The tensions behind the current intra-jihadist turmoil first became public in April 2013. The Islamic State of Iraq (ISI), which had formed from Abu Musab al-Zarqawi’s al-Qaeda in Iraq, had released an audio message asserting authority over Jabhat al-Nusra, which was al-Qaeda’s Syrian affiliate. ISI declared that it had created Jabhat al-Nusra, and that they were unifying under the new name of the Islamic State of Iraq and al-Sham (ISIS). Jabhat al-Nusra refused to concede this, and released an audio message disputing that it was created by the ISI, rejecting the new name and re-affirming allegiance to al-Qaeda’s leader Ayman al-Zawahiri. That led to a situation where ISIS and Jabhat al-Nusra were both claiming leadership within Syria. At first those tensions were held in check, as the groups shared the common enemies of the Assad regime and rival opposition groups. But when Zawahiri made clear (PDF) that he considered Jabhat al-Nusra to be al-Qaeda’s only legitimate representative in Syria, and that ISIS should restrict its activities to Iraq, ISIS began increasingly to reject al-Qaeda’s authority. ISIS and its supporters argued that ISIS’s leader Abu Bakr al-Baghdadi had never pledged allegiance to Zawahiri; that, as ISIS constituted an Islamic State, it had greater authority than al-Qaeda; and that by ordering ISIS to restrict its activities to Iraq, al-Qaeda was acquiescing to Western-created (Sykes-Picot) borders. In February 2014, as the dispute continued, Zawahiri publicly disowned ISIS. At this time ISIS was already fighting against other Syrian rebel forces (the Free Syrian Army and the Saudi-backed Islamic Front), and soon was in open violent conflict with Jabhat al-Nusra as well. ISIS has also been attempting to convince al-Qaeda affiliates and other jihadist groups across the world to switch sides, with some success (see here, here and here). What began as a dispute over authority within Syria has become a struggle for leadership of the entire global jihadist movement. Following ISIS’ expulsion from al-Qaeda, Abu Sulayman, along with several other jihadist ideologues, publicly called on Ayman al Zawahiri to provide more compelling responses to ISIS’ criticisms. Days later he appeared in a 45-minute Jabhat al-Nusra video, making a detailed condemnation of ISIS and defence of al-Qaeda and Jabhat al-Nusra. A few days after that video, Abu Sulayman used his Twitter account to condemn the killing of Jabhat al-Nusrah’s leader in Syria’s Idlib province, most likely by ISIS. However, Abu Sulayman soon adopted a lower profile in the Nusra-ISIS dispute. Following ISIS’ military advancement, the Caliphate declaration, and the US response, few detailed critiques came from Abu Sulayman. He did not appear in further videos, but did condemn ISIS’ Caliphate declaration through Twitter and in late August, al-Nusra released photos of Abu Sulayman outside Aleppo, sitting on sandbags and holding a firearm, describing him as on the “frontlines” against ISIS. Following US airstrikes in Syria, Abu Sulayman expressed tentative solidarity with ISIS, in the name of uniting against the common enemy. This was consistent with the position taken by various al-Qaeda affiliates, of siding with ISIS against the United States to a degree, but not accepting ISIS’ Caliphate declaration and its claims of authority over other jihadist groups. 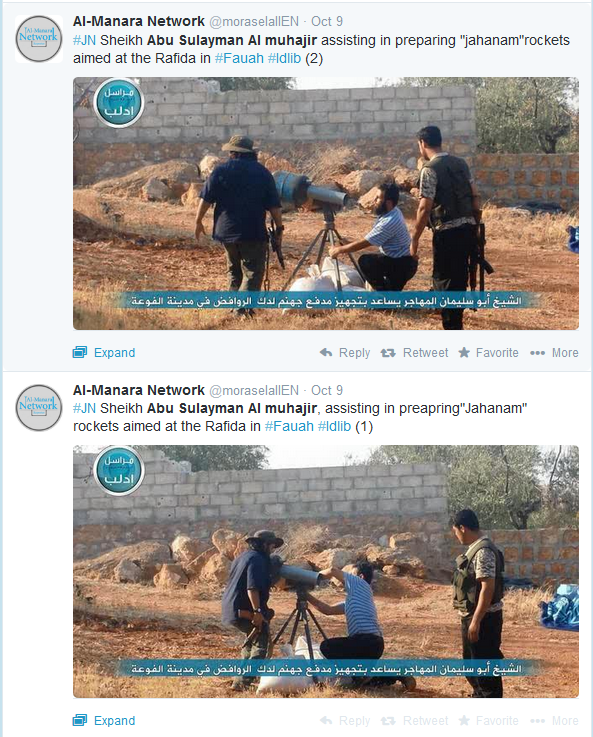 On 9 October another two photos were released, purportedly showing Abu Sulayman helping al-Nusra fighters prepare rockets. However this time the photos were claimed to show him fighting not against ISIS but against Syrian government forces. From that point, he remained mostly quiet, aside from occasional Twitter comments until his account was shut down. But now he’s appearing on al-Jazeera, and becoming forthright again in his criticism of both ISIS and the West and defending al-Nusra/al-Qaeda’s view of the Syrian conflict.